The view of the new wing at Smith Elementary School from West Heffner Street. The new wing adds seven classrooms and a gymnasium and is designed to accommodate fifth grade students. The expansion will be completed by the start of this school year. A East-facing view of the new wing of classes at Smith. O’Sullivan said the new wing will also have lockers specifically for fifth-graders so they wouldn’t have to walk all the way back to the main section of the school to get to their lockers. 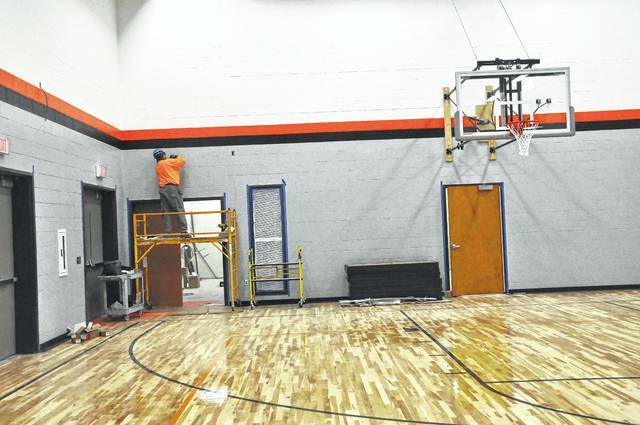 Construction crews put the finishing touches on the new gymnasium at Smith. Engineer Katie O’Sullivan said the design of the gyms at Dempsey Middle School, Carlisle Elementary, Woodward Elementary and Smith are similar and meant to give consistency to all the schools. 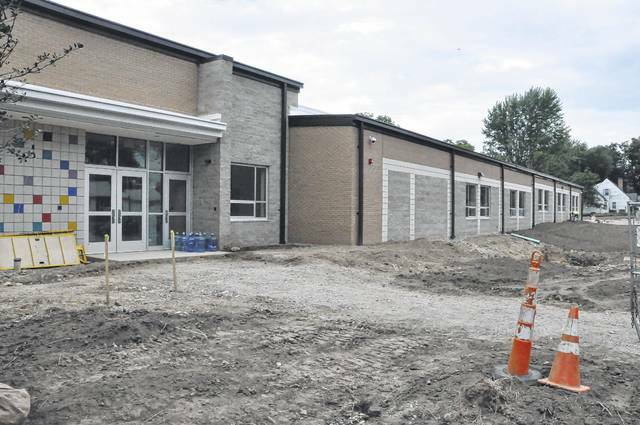 The construction project to add new classrooms and a gymnasium to accommodate fifth graders at Smith Elementary School is nearly completed. The Delaware City School District began work last summer to add new classrooms to Smith and Woodward elementary schools to accommodate moving the elementary schools to a kindergarten through fifth grade model. Last week, Katie O’Sullivan, an engineer at Turner Construction Company, said the project is nearing its conclusion. O’Sullivan said seven new classrooms that will accommodate the fifth graders are finished and awaiting new furniture. O’Sullivan said the new wing will have lockers specifically for fifth graders so they won’t have to walk to the main section of the school to get to their lockers. O’Sullivan said the finishing touches are being completed at the gymnasium, which was added so the old gym could be used primarily as a lunch space and not have to serve double duty. Smith is also gaining a staff parking lot to replace the small and narrow lot that existed before, O’Sullivan reported. She said the parking lot will help reduce the amount of street parking on West Heffner Street. The construction at Smith is on schedule to be completed before the start of the 2017-2018 school year, O’Sullivan said. Likewise, construction at Woodward is nearing completion and scheduled to be concluded by the start of the school year. Woodward will gain eight new classrooms, an art room, a music room, and a new gym. The classrooms at Woodward will house all day kindergarten and preschool and fifth graders will be taught in existing classrooms. Carlisle Elementary and Schultz Elementary also underwent construction during the 2015-2016 school year to accommodate fifth graders. The renovations were completed when 2016-2017 school year began. School officials said because the buildings would be under construction during the 2016-2017 school year, fifth graders at Woodward and Smith would be attending classes at Willis Education School for the school year. Willis had previously been used to instruct fifth and sixth graders and now houses administrative offices after some renovation last year. Sixth grade is now taught at Dempsey Middle School, which underwent a large construction project during the 2015-2016 school year. The new sixth-grade wing added 21 spaces for students including science labs, art classrooms, and a new gym. Construction at all of the schools was funded by the 2013 3.6-mill bond issue approved by Delaware voters. 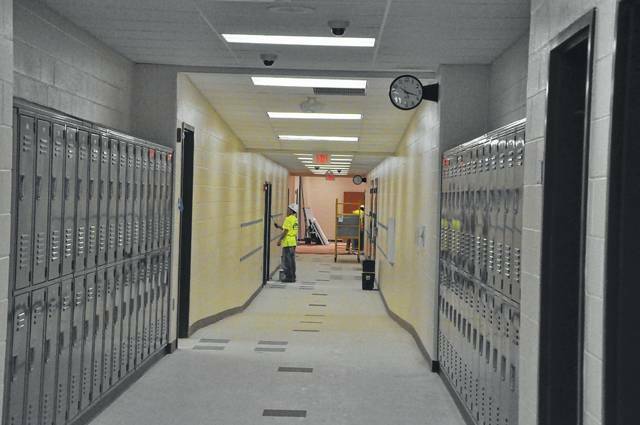 The bond issue also funded the construction of the new wing and renovations at Delaware Hayes High School. https://www.delgazette.com/wp-content/uploads/sites/40/2017/06/web1_DSC_0185.jpgThe view of the new wing at Smith Elementary School from West Heffner Street. The new wing adds seven classrooms and a gymnasium and is designed to accommodate fifth grade students. The expansion will be completed by the start of this school year. https://www.delgazette.com/wp-content/uploads/sites/40/2017/06/web1_DSC_0182.jpgA East-facing view of the new wing of classes at Smith. O’Sullivan said the new wing will also have lockers specifically for fifth-graders so they wouldn’t have to walk all the way back to the main section of the school to get to their lockers. https://www.delgazette.com/wp-content/uploads/sites/40/2017/06/web1_DSC_0169.jpgConstruction crews put the finishing touches on the new gymnasium at Smith. Engineer Katie O’Sullivan said the design of the gyms at Dempsey Middle School, Carlisle Elementary, Woodward Elementary and Smith are similar and meant to give consistency to all the schools.